McClain’s Beckley Smith throws across the diamond to Kaleigh Easter at first base on Wednesday at Mitchell’s Park in Greenfield where the Lady Tigers battled FAC rivals the Lady Blue Lions of Washington High School. McClain’s Josie Crabtree throws a pitch Wednesday against the Lady Blue Lions of Washington High School. 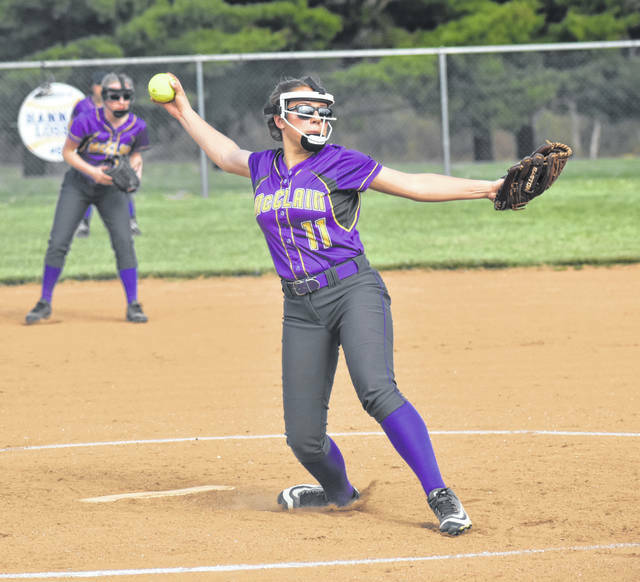 Crabtree pitched all five innings against the FAC rival Lady Blue Lions and allowed only one run in the 13-1 five inning game. 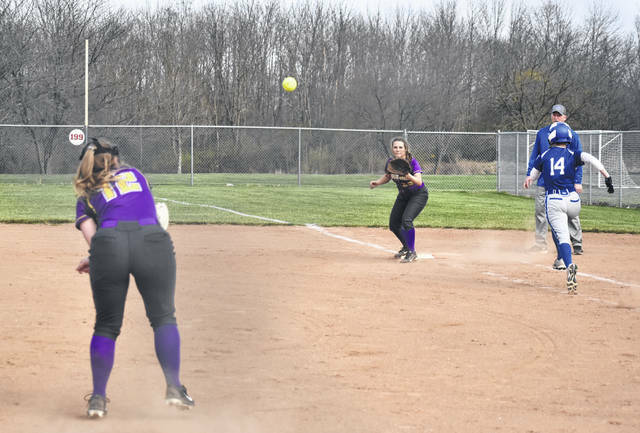 GREENFIELD — The McClain Lady Tigers varsity Softball team hosted their Frontier Athletic Conference rivals the Lady Blue Lions of Washington High School at Mitchell’s Park in Greenfield on Wednesday and dominated the visitors in a 13-1 run rule shortened game. Freshman Josie Crabtree pitched all five innings for the Lady Tigers and didn’t allow a run until the top of the fifth inning when the game was out of reach for the Lady Blue Lions. Crabtree allowed six hits, walked one, hit one and struck out one in the game. Defensively the Lady Tigers were on top of their game against Washington and recorded only two errors against their FAC rivals while recording several gems in the infield and outfield. One play that stood out, without recording an out, was a hard hit ball between third base and short stop that saw Beckley Smith and Kaylee Stevenson move in unison to make the play with Stevenson gobbling up the ball in the infield and firing across the diamond to first base, the runner was called safe on the play. Offensively the Lady Tigers lit up the scoreboard early and often against Washington including five run in the first inning. Crabtree got McClain started with a single to lead off the game and then advanced to second on a sacrifice by Alison Beatty. Smith grounded into a 4-3 putout in the next at bat before Stevenson was hit by a pitch and advanced to first base. Bri Weller plated Crabtree and Stevenson with a triple to the centerfield fence and then scored when Liz Kegley reached on an error by the Lady Blue Lions short stop. Kaleigh Easter followed up with a single and both Easter and Kegley scored when Brooke Beatty drove them in with a hard ground ball between third and short stop for the final two run of the inning that gave McClain a 5-0 lead after one. A. Beatty led off the second inning with a single for the Lady Lions and then stole second and advanced to third on a passed ball during Smith’s at bat in the three slot. Smith singled in her at bat to drive in A. Beatty and extend McClain’s lead to 6-0. The Lady Tigers put up for more run in the bottom of the third inning when Crabtree reached on an error with two outs and A. Beatty recorded a single and stole second base to put runners on second and third for Smith. Smith took advantage of the second error of the inning for the Lady Blue Lions to drive in Crabtree from third base and advance A. Beatty to third. Stevenson hit a towering fly ball to left field that scored A. Beatty and Smith and then scored later in the inning when Bri Weller drove her in with a double to centerfield. The Lady Lions added three runs in the bottom of the fourth inning when B. Beatty, Kyla Burchett and Crabtree all crossed home plate to make it 13-0. Washington scored one run in the top of the fifth inning but never threatened the Lady Tigers in the 13-1 McClain victory. The Lady Tigers will be back in action on Friday when they travel to Hillsboro to take on a Lady Indians squad that has shown improvements in recent games and will be a test for the McClain Ladies.